We are pleased to welcome you to our office. If you're looking for quality eye care with a personal touch please give us a call. We look forward to the opportunity of serving your family's optometric needs. Conveniently located in Brea, CA, we would be delighted to have you as a patient. Did you know that many diseases can be discovered through a carefully planned eye exam? 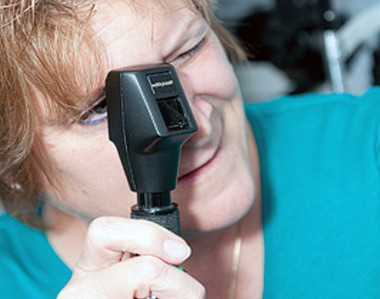 Our state of the art diagnostic equipment allows us to detect even the smallest changes in your vision and eye health. This helps us evaluate your risk for many diseases including hypertension and diabetes. Dr. Stern utilizes the Optos retinal scanner, which in many instances precludes the need for dilating drops. You can have a thorough eye exam during your lunch hour if needed, without the four hours of blurriness that follow the drops. Dr. Stern fits a wide variety of contact lenses. If your needs are soft disposable, color, bifocal contacts or even rigid gas permeable, she will have you wearing a pair seeing 20/20 in no time! Our office is equipped with an onsite, state-of-the-art optical lab allowing us to have complete control over the quality of eyeglasses that we dispense. In many cases your prescription eyeglasses can even be ready for you in one day! With our varied inventory of designer frames and sunglasses, you will have the opportunity choose styles from Christian Dior, Oakley, Maui Jim and Silhouette to name a few. We can also make you, our patient, happy by providing you with stylish and affordable glasses and sunglasses. Regardless of your visual needs or requirements, you should not have to compromise your style and fashion for visual functionality. Priced for every budget, we have designer frames and sunglasses that will allow you to Look Great, See Great and Feel Great! So let's get started on the new you and make your appointment today!